We are the best, number 1 and oldest army and police supply shop in the Southern Hemisphere. We offer equipment, that enhances and caters to all your Police, Security and Army needs. We have the best in terms of quality in various categories and fields. You can choose what you like from our wide range of products. We provide our clients only quality equipment and accessories. We move with the times and are constantly upgrading and updating our merchandise. It is not surprising that Sad Sacks are leaders in their field with a wide range of top quality products on offer. The company has been running for over 50 years but has been family owned for 36 years and we always pride ourselves in keeping abreast with the latest technology and design trends. During the past 50+ years we have gained the reputation of manufacturing and supplying top quality and guaranteed products. We are based in Durban but service a large customer base throughout Southern Africa and abroad. Our team is a small dedicated unit that strive to always satisfy the customers needs. Our staff have a combination of 140 years of experience. So you will always be assured that you are dealing with people that have been in the game for a long time. Appearance , quality, durability and strict conformity to specifications and timely deliveries of our products is truly the most important criteria that we follow. 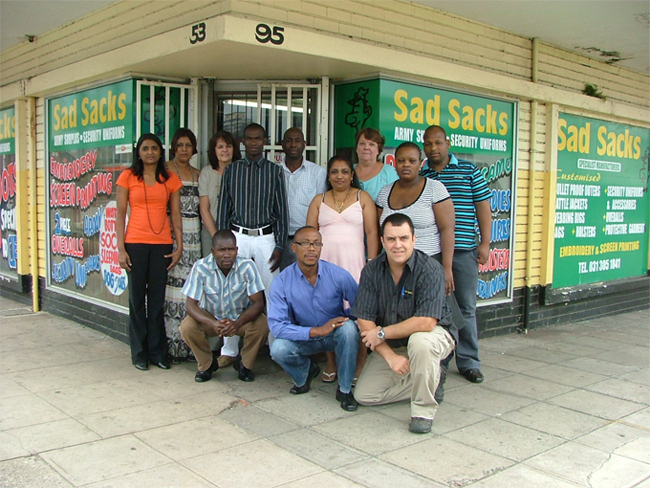 If you are looking for world class service and a quality product don’t hesitate to contact Sad Sacks today.